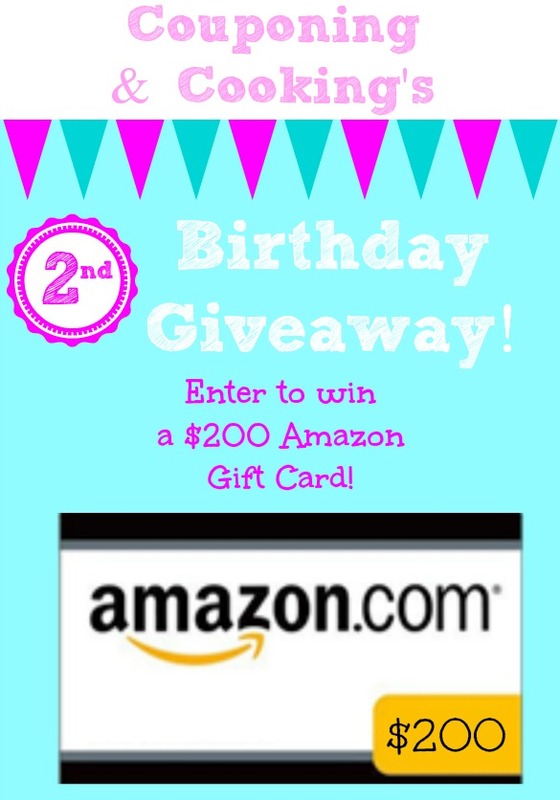 I cannot believe that Couponing & Cooking will be celebrating its 2nd birthday on Tuesday! When I first started out I could not imagine that I would ever have more than 12 readers or that I would make so many amazing blogging friendships along the way. I know that I would have never stuck with this if it weren't for all of you who comment, pin, like, share and send happy thoughts my way when things get crazy. I could have never in my wildest dreams thought that this blog would become such a huge part of my life and who I am. I am eternally grateful to each and everyone of you. To thank all of my amazing readers and supporters who have joined me for the last two years of fun, I wanted to giveaway something that I know everyone can use. I know that for me, Amazon money is just like cash because really, what can't you get on Amazon? And most of the time, there's free shipping too! So join me in celebrating two fun/crazy/inspiring/stressful/wouldn't change it for the world years of blogging! The giveaway runs through midnight on Saturday September 21st so be sure to use the Rafflecopter widget below to enter. Be sure to stop by some of my amazing friends from Online BlogCon who have so generously helped me make this birthday celebration possible!